However, despite evident successes, as seen by the increase in cross border trade, the terms and resulting impact of the agreement has been severely criticised by the Trump administration. They say NAFTA allows unfair competition from cheap labour in Mexico as well as biased advantages for Canada in several areas e.g. agriculture, car tariffs and cultural provisions. Whilst the States recently reached an accord with Mexico, officials from the US and Canada announced at the “11th hour” that they had also arrived at an agreement after a turbulent few weeks of negations, thereby saving the three-way pact. The resulting deal, a remake of NAFTA, is now called the United-States, Mexico, Canada agreement (USMCA). 1.Changes to auto-company directives; previously criticised as being heavily biased against US manufacturers. 2.Following the new agreement, 65% of auto-components must be made within North-America and 30% of the car must be produced by labourers earning at least $16 an hour. 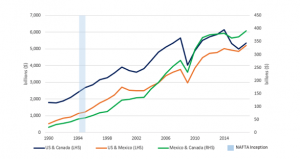 3.The aim of these recent policies is to dampen the impact of cheap labour in Mexico and cheaper imports from abroad. The deal is expected to be signed in 2019 following congressional approval. Whilst the outcome of the upcoming elections might impede the President’s ability to initiate policies, Canada’s last-minute acceptance of the terms is said to make approval of Trump’s USMCA far more likely. Trump is now commencing direct trade talks with Europe and Japan. 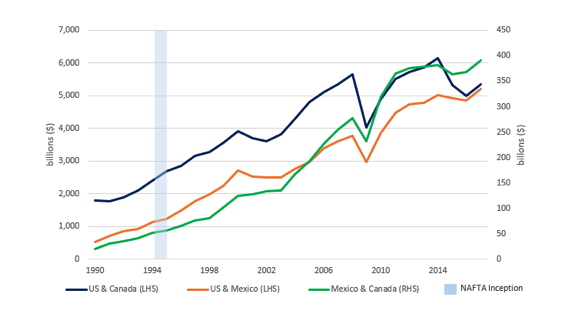 Having settled with Canada and Mexico, the sudden increase in negotiations with trading partners other than China could be considered a tactical move. Whilst terms are being reached with other nations, China may risk being exposed to the might of the US if a deal is not reached between the two nations. Trump is using his new partners to ‘call out’ China in relation to its abuse of intellectual property rights and dumping of cheap products. Although critics argue about Trump’s brutish rhetoric on trade, there is a general recognition for a need to change; a consensus that China’s deliberate approach to shielding its domestic interests results in an unfair trading style. What causes most angst is the negotiating tactics that Trump is using. However, a trend is emerging. His stance is tough initially but once he reaches the table sensible terms can be agreed. One of the most closely observed indicators of business activity rebounded this week after a lacklustre report in August. This improvement indicates a positive 12-month outlook by the majority of UK business leaders. 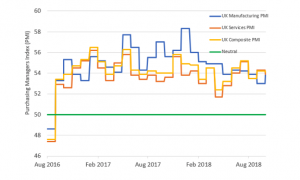 The UK manufacturer’s Purchasing Managers Index (PMI) rose from a revised 53.0 in August to 53.8, exceeding analyst expectations of 52.5. As a rule of thumb, anything above 50 reflects an expansion; in areas such as new orders, production, inventory levels, supplier deliveries and employment.The UK PMI has now indicated ongoing expansion for 26 consecutive months. An increased PMI in the manufacturing sector for September was welcomed after August’s slowdown, which had raised fears that it was the start of a downward trend. Confidence took a knock when exports slumped to their lowest level in two years. This happened amid global trade tensions preventing UK net exporters benefitting from the relatively weak pound, down 1.25% relative to the dollar and off 0.51% relative to the euro over the month of August. At the same time, input costs continued to rise, pushed up by rising oil prices because of oil markets experiencing supply constraints following a sustained period of global expansion. The same pressures impacting UK businesses remain but appear to be receding as the UK’s negotiations with the EU reach a climax. Brexit has been thrashed out at the Conservative Party conference this week and examples of new trade agreements between other countries are discussed in the article above. The easing of trade tensions has fed through to recent confidence data with firms indicating increasing new orders, both domestically and internationally. Recruitment into smaller and medium sized businesses also increased over the month, outweighing headcount reductions in global firms, who are generally impacted by international trade policy concerns. It is worth reminding our readers that the UK manufacturing sector is no longer the engine of economic growth. It accounts for only around 10% of UK Gross Domestic Product (GDP- the value of all goods and services). The economy here is fuelled by the service sector (c.80% of GDP) thus it is important to put the data into its proper context to assess what is happening. Thankfully, the services sector is also indicating expansion. 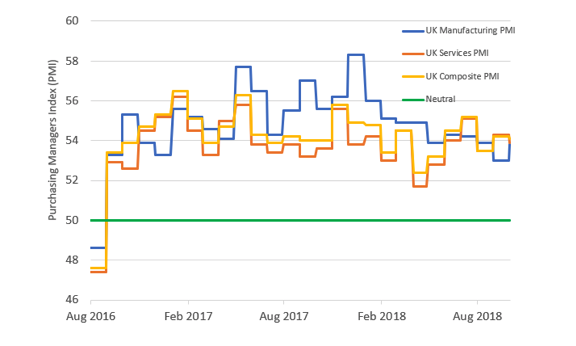 Our chart above, shows UK Service PMI dipping ever so slightly in September as many firms held back on investment because of Brexit uncertainty. However, it is above neutral at 53.9 demonstrating continuous expansion and a positive outlook. Comparing these figures to wider Europe and the US, below, we can see that the UK is well positioned with the headline ‘composite’ figure, which is an amalgam of services and manufacturing, being more optimistic than the US. It is also at the same level as the EU. Lower confidence impacts future business activity and ultimately feeds through to GDP. Thus, based on recent readings, third quarter (Q3) GDP figures should be better than expected with confidence remaining robust. Economic expansion for Q3 is now forecast to be 0.50%, putting the UK on track for an annual GDP expansion of 1.30%. This is not rip roaring but solid. If growth turns out as forecast it will offer reassurance to policy makers at the Bank of England that the blip we experienced at the start of the year is not the beginning of the end, but the start of a new beginning. There is a growing sense that the UK is poised for a strong rebound once decisions are taken in relation to the UK leaving the EU.